Mission Economic Development Agency purchases the building on 4830 Mission Street, which protects tenants, transforms the building to a permanent affordable housing complex, and marks the Excelsior District’s first Small Sites acquisition. 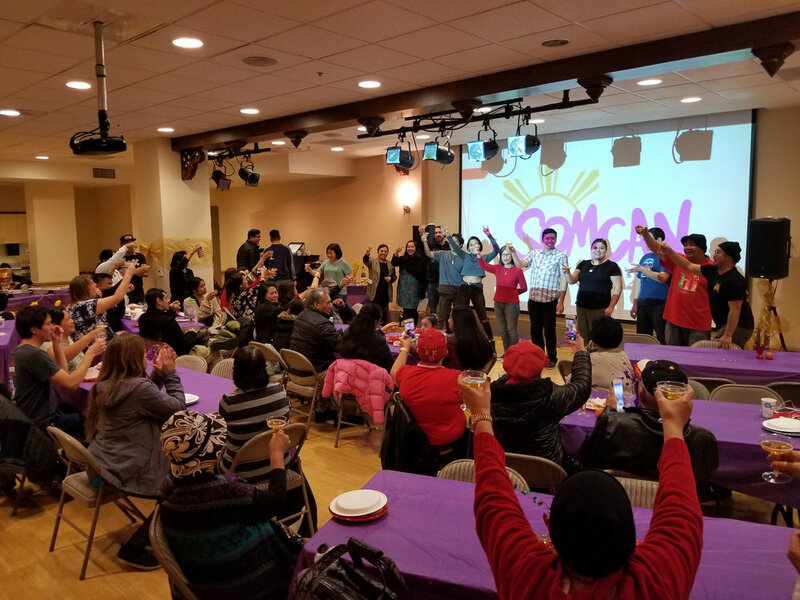 SOMCAN provided culturally-competent outreach and counseling to multiple Filipino tenant families in the building to educate them about their rights and options, leading to the purchase. The San Francisco Youth Commission adopts proposals of YOHANA pertaining to pedestrian safety and night safety. The proposals are now being reviewed and deliberated on by the San Francisco Board of Supervisors, as part of “Vision Zero”, the City’s commitment to achieving zero pedestrian fatalities by 2024. SOMCAN created public pressure for owners of two rental buildings in SOMA to sell them to the San Francisco Community Land Trust in February and April 2016. This prevented the evictions of long-time families and keeps the units affordable in perpetuity. “Ignite Open Mic,” YOHANA’s youth-led open-mic, is established, providing a safe, creative space for the cultivation of youth culture and expression. The event regularly draws in packed crowds of local youth and adult allies. SOMCAN and other community groups pressure the owners of the historic Gran Oriente Filipino Hotel to sell the property to a nonprofit (as opposed to a private buyer) in order to protect tenants and preserve the property’s affordable housing. As a result, Mission Housing was able to purchase the building. As a land-trusted building, the Gran Oriente continues to provide affordable housing and serve as a cultural gathering space for the community. SOMA is designated as a “Filipino Cultural Heritage District” by the San Francisco Board of Supervisors, in recognition of the many and varied contributions of Filipino-Americans to the area since the 1920s. An ongoing, people-led lawsuit is filed to challenge the multi-million luxury development, 5M, demonstrating the neighborhood’s resistance to and resilience against slick corporate marketing and would-be divide-and-conquer tactics. If the project is completed, it would have irreversible, damaging effects on immigrant and working class communities in the SOMA. Youth Organizing Home & Neighborhood Action (YOHANA) is formed to cultivate the next generation of resident leaders. Since its founding, YOHANA members have successfully advocated for Free Muni for Youth and Free City College, among many other neighborhood and citywide gains, establishing themselves as an organizing force to be reckoned with in San Francisco. After being approached by tenants at risk of Ellis Act Eviction when their building was put up for sale by their landlord, SOMCAN approached the San Francisco Community Land Trust to purchase and preserve the 5-unit property. Fought for San Francisco’s first Youth & Family Special Use District, a 12-block area that recognizes and acknowledges the concentration of youth and families and encourage affordable housing, clinics, and grocery stores, open space, and recreational centers that are youth- and family-friendly. Victoria Manalo Draves Park, named after the first Filipina olympian, opens to the public. Draves grew up along Sixth Street in the 1920s and ‘30s. Partnered with Bessie Carmichael parents and teachers to build a new middle school facility in SOMA and preserve the pioneering Galing Bata Afterschool Program. Led the community in winning a historic mitigation package, a $20 million Community Stabilization Fund, to offset the gentrifying impacts of the Rincon Hill area plan, through the South of Market Community Coalition. Preserved 366 rent-controlled units slated for demolition, and negotiated an additional 135 affordable housing units with the Trinity Plaza Tenants Association. Recognizing that residents can’t fight for their rights when they’re too busy just surviving, SOMCAN launches United Families Program to provide linguistically- and culturally-competent support services to neighborhood families. In partnership with the Continental Collaborative, SOMCAN negotiated a community benefits agreement with the developer of the Intercontinental Hotel, resulting in a series of know-your-rights workshops for SRO hotel tenants, youth and families, seniors, and Filipino WWII veterans. SOMCAN was founded after small businesses housed in the Mint Mall received simultaneous eviction notices. In response, various sectors of the community united and mobilized, and the evictions were subsequently halted. Canvassed thousands of District 6 voters around ballot measures that protect tenants, ensure that the rich pay their fair share, and other pro-people measures.